With the reigning king of crossovers, John Munch, retiring from Law & Order: Special Victims Unit – after twenty years on television – we thought it might be best to bring you up-to-date on the Tommy Westphall Universe. John Munch first appeared in the pilot episode of Homicide: Life on the Street in 1993. 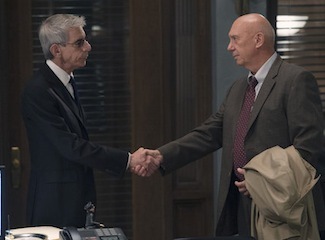 Since then, Munch has appeared in Arrested Development, Law & Order, Law & Order: Trial by Jury, The X-Files, The Wire and The Beat drawing all of these series into the same fictional universe. Belzer also appeared playing the character on 30 Rock and the character of Munch exists in the BBC series, Luther. We’ve been archiving the Tommy Westphall universe for nearly 15 years. It grew from a list of crossovers from Homicide and St. Elsewhere – which had direct character crossovers to at least a dozen different series – to a list of nearly 400 different television shows. We stopped updating the grid and the key six or seven years ago. It had grown so large we had to stop and let it keep going all by itself. No longer did we need to archive the Tommy Westphall Universe to prove that it was real – it was a meme and something to be objected to. The earliest show is I Love Lucy (1951-1962) and there are currently twenty-six shows still on the air that connect to the Tommy Westphall universe in some way: whether by characters, by fictional companies, fictional brands or fictional universities.